With the closing of the Chicago futures trading pit comes an end to a lucrative type of career that did not require a college degree. A college degree was not required for this white collar job. Another case of technological advancements destroying jobs, a process repeated throughout history. But with the jobless recovery still a problem, it remains to be seen if replacement jobs for former traders and similar displaced workers will still provide a middle class living. William Aldenmarch, “As Silence Falls on Chicago Trading Pits, a Working-Class Portal Also Closes”, New York Times, March 24, 2015. The stark differences that show blacks and Hispanics trailing in academic achievement indicate a growing problem for our country’s future economic health. Primary working-age population in the United States will experience a net loss of 15 million whites between 2010 and 2030.
Who has the skills to prosper, or even survive, in our knowledge economy? 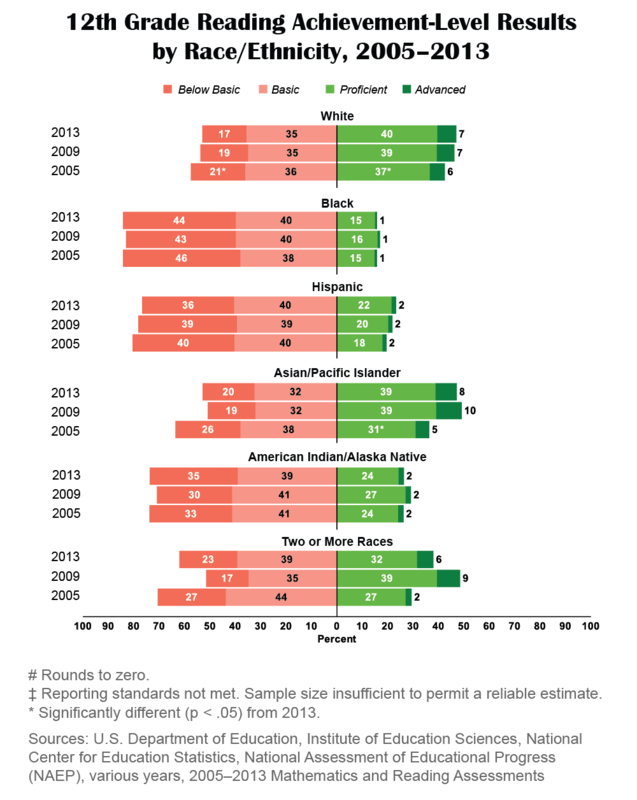 By 2044, people of color will account for a majority of the U.S. population. In the newest Brookings Essay, Jennifer Bradley examines efforts in U.S. metropolitan areas to prepare a more diverse workforce, with a particular focus on Minneapolis-St. Paul. Minnesota reflects the achievement gap common throughout the United States. With most of the future growth in the labor force coming from people of color, it’s alarming to have to acknowledge how profoundly the existing education and training systems have failed them. Statewide, 85 percent of whites graduated from high school on time in 2013, compared to 58 percent of Hispanics, 57 percent of blacks (including both U.S.-born African-Americans and African immigrants), and fewer than half (49 percent) of American Indians. The gaps are slightly larger at the metropolitan level, and wrenching for the largest city, Minneapolis, where just 51 percent of Africans, 41 percent of Hispanics, 40 percent of African-Americans, and 34 percent of American Indians graduate from public schools on time. Business leaders have become heavily involved in trying to find solutions. Some employers have initiated training programs geared toward helping low-skills workers develop into self-sustaining employees. But that doesn’t blunt the recognition that K-12 education is at the core of any solution. Jennifer Bradley, “The Changing Face of the Heartland: Preparing America’s Diverse Workforce for Tomorrow”, Brookings Institution, March 17, 2015. Are older workers crowding out job opportunities for young people? Older workers’ expanding participation in the labor force may be at the expense of employment opportunities for younger workers. One of the major trends in the U.S. workforce during the early 21st century is seniors’ expanding participation in the labor force. People who qualify for AARP membership have been retiring later and are more likely to be in the labor force now than people the same age were during the 1990s tech boom. There have been significant changes for all seniors, but the increase is most striking among people 65 and older. For 75-year-olds, labor-force participation has risen to 14 percent from 9 percent since 2000. The number of people age 65 to 79 in the workforce has grown by 3.5 million. Of that, 1.6 million is due to the growing population in that age group, and 1.9 million is due to the increased propensity to work. Employment helps seniors remain self sufficient. 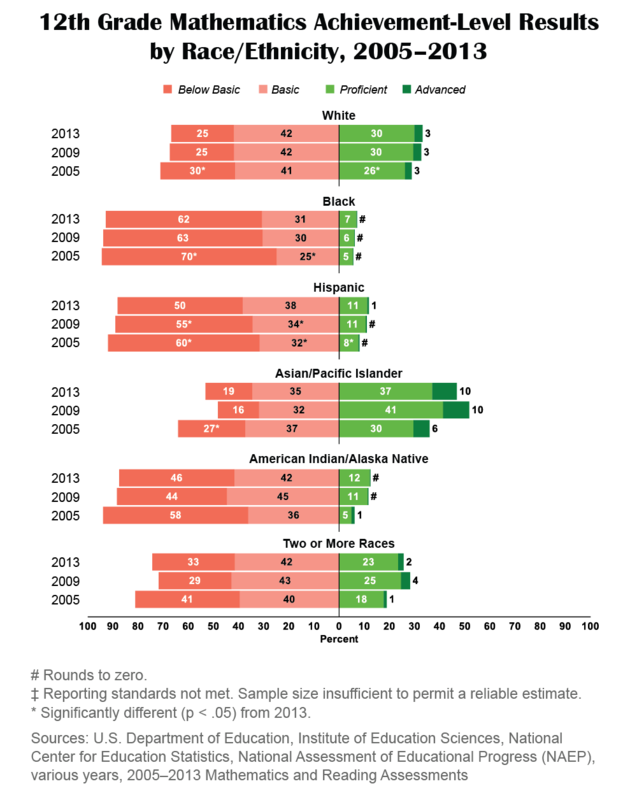 The United States is going to be a very different place, demographically, for the next 30 years. Seniors putting in more years at the office will help ease that transition, cover a small part of Social Security’s deficit, and allow more older Americans self-sufficiency in their retirement. 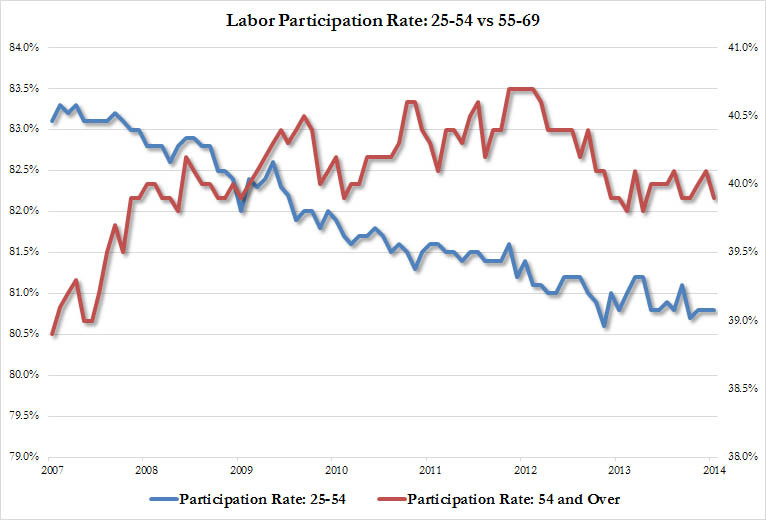 The sliding labor participation rate for younger workers is clear. The question remains how much this affects younger workers who are still suffering during this jobless recovery. Salim Furth, “What Percent of 75-Year-Olds Are Still Working?”, The Daily Signal, March 21, 2015. 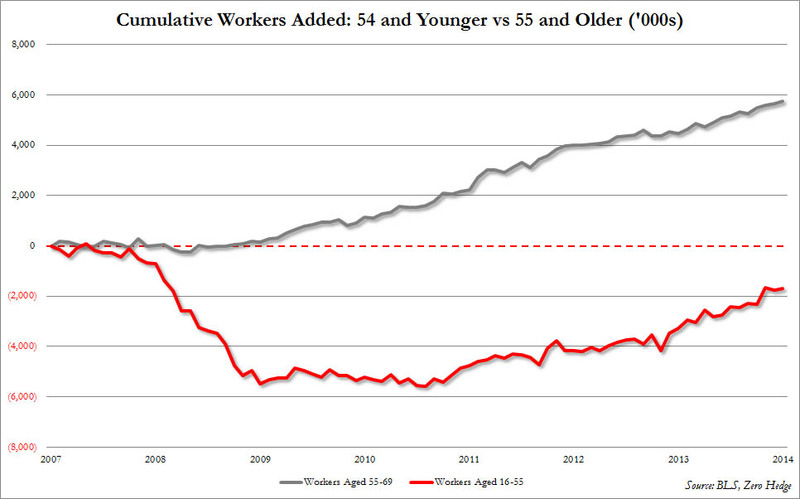 Tyler Durden, “Old vs Young: The Story Of America’s Two Labor Markets”, Zero Hedge, January 9, 2015. Posted in jobs after college | Comments Off on Are older workers crowding out job opportunities for young people? Megan McArdle writes about the importance of the two-parent family, a social institution offering a type of support for children that government cannot seem to match. Robert Putnam’s “Our Kids: The American Dream in Crisis” has touched off a wave of print and digital commentary. The book chronicles a growing divide between the way affluent kids are raised, in two-parent homes whose parents invest heavily in educating their kids, and the very different, very unstable homes in which poorer kids generally grow up. When the problems of single-parent families are debated, some will “argue that there are lots of good ways to raise kids outside the straitjacket of mid-century, middle-class mores”. I have been trying to find a more delicate way to phrase this, but I can’t: This is nonsense. The advantages that two people raising their own biological or jointly adopted children have over “nontraditional” family arrangements are too obvious to need enumeration, but apparently mere obviousness is not enough to forestall contrary arguments, so let me enumerate them anyway. Raising children the way an increasing percentages of Americans are — in loosely attached cohabitation arrangements that break up all too frequently, followed by the formation of new households with new children by different parents — is an enormous financial and emotional drain. Supporting two households rather than one is expensive, and it diverts money that could otherwise be invested in the kids. The parent in the home has no one to help shoulder the load of caring for kids, meaning less investment of time and more emotional strain on the custodial parent. Children will spend less time with their noncustodial parent, especially if that parent has other offspring. Add in conflict between the parents over money and time, and it can infect relationships with the children. As one researcher told me when I wrote an article on the state of modern marriage, you frequently see fathers investing time and money with the kids whose mother they get along with the best, while the other children struggle along on crumbs. People often argue that extended families can substitute, but of course, two-parent families also have extended families — two of them — so single-parent families remain at a disadvantage, especially because other members of the extended family are often themselves struggling with the challenges of single parenthood. Extended families just can’t substitute for the benefits of a two-parent family. Government can’t, either; universal preschool is not going to make up for an uninvolved parent, or one stretched too thin to give their kids enough time. Government can sand the rough edges off the economic hardship, of course, but even in a social democratic paradise such as Sweden, kids raised in single-parent households do worse than kids raised with both their parents in the home. The share of American children born to single mothers has grown seven-fold since 1960. More than 40 percent of American children are now born to unmarried parents, down from just five percent in 1960, according to Pew Research Center. Fifty years ago, the vast majority of adults — 72 percent — were married. The same is true for only about half of adults today. The declines in marriage are especially pronounced in families with lower earnings. Tying the knot is increasingly a marker of class status in America. Megan McArdle, “How Hollywood Can Save Our Families”, Bloomberg, March 17, 2015. Seth Freed Wessler, “What Happened to the Middle-Class American Family?”, CNBC, March 18, 2015. Guillaume Dumas attended classes, made friends, and networked on some of America’s most prestigious campuses—for free…. The schools included Yale, Brown, UC Berkeley, and Stanford. But he did not obtain what is arguably the most valuable part of an elite college education. … Most people go to college primarily to get a piece of paper, and learning is something that happens incidentally…. Economist Bryan Caplan, who has extensively studied the college wage premium, elaborates on the signaling benefit of a degree, derived largely from actually receiving a diploma. Researchers usually interpret sheepskin effects as signaling. If finishing your last year of college sharply boosts your income, the reason probably isn’t that colleges withhold the financially lucrative material until your senior year. College professors don’t usually need to police their classrooms to prevent people like Dumas from sitting in on classes because lectures and assignments are not the most valuable components of what they are offering. Those components are mostly steps on the road to the real reward — a college degree. Students who never enrolled, or perhaps more significantly never paid for their courses, are not a concern for colleges. Ollivier Dyens, deputy provost of student life and learning at McGill, explained why his university wasn’t worried about this sort of activity. “Not a lot of people will go through all of this without having some sort of credentials attached to it,” he says…. Joe Pinskermar, “The Man Who Snuck Into the Ivy League Without Paying a Thing”, The Atlantic, March 5, 2015. Bryan Caplan, “The Present Value of a Sheepskin”, EconLog, January 20, 2012.